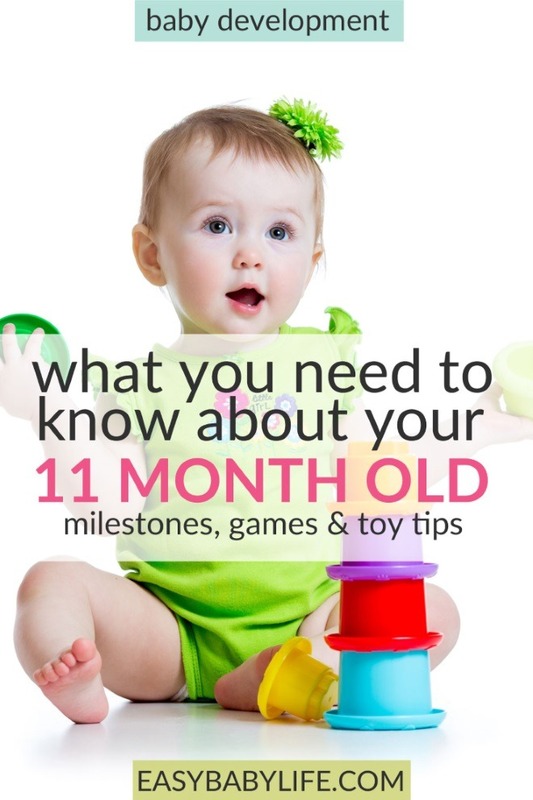 The Energetic 11-Month-Old Baby - Development Milestones, Fun Games to Play and Toy Tips! Home > Baby Development Month By Month > The Energetic 11-Month-Old Baby – Development Milestones, Fun Games to Play and Toy Tips! In this article, you’ll find development milestones for the 11-month old baby, ideas on games to play and toy tips. You can also see the typical 11-month old in action in video clips. An 11-month-old baby has a lot of energy! Much more energy than judgment… When 11 months old, our daughter fell when she was trying to pull herself up to standing, holding on to the TV. She crashed into a sharp corner with her eyebrow. Poor girl! We rushed off to the hospital, convinced that she would need several stitches. I felt so bad! Luckily no stitches were necessary and today, the scar is almost invisible. If your baby is moving around, these are busy times! Safety is important as well as watching your baby more or less all the time. 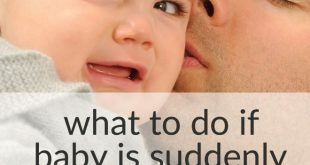 But no matter how hard you try, your baby is likely to get a little bit hurt from time to time. Try to minimize the risks. This is a good time to baby-proof your home. Something more fun to think about – your baby’s first birthday is coming up! Party time? Only 1 month left until your baby’s first birthday and your baby is probably becoming more and more independent. He or she can move away from you (or to you) one way or the other. It doesn’t have to be traditional crawling or walking; many babies develop their very own persal style. (Here’s a poll on crawling styles. 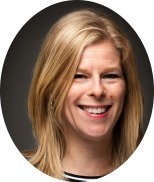 He or she can listen to – or ignore – your “no”. Baby can make himself understood by using a few words. Your baby might be able to follow your simple instructions like “go get that ball”. 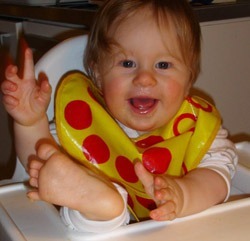 Some 11-month-old babies can stand without support and some even walk. Some little kids also climb long before they walk. That can be a real challenge for the parents! Eye-hand coordination is good enough for him or her to be able to stick the index finger into a hole. Stranger anxiety is probably declining – for now. Music, music, music. Dancing is a great way for a baby to practice his or her balance. Standing on knees or feet and rocking slowly to the music is lots of fun. At this age, a baby practices new skills by repeating them again and again and again, like stacking blocks or taking things out of a bag and putting them back again. Now that your baby probably sits steadily without support, playing in a sandbox can be great fun. Here are some tips for having fun at the playground. Taking turns doing whatever is appreciated. Try pulling something out of a bag, making funny faces or clapping hands. Let your baby help you in your house work, like doing the dishes or wiping the floor. Some sort of steady rider can also be fun. It needs to be quite low, though. Here is a super cute one, that doubles as a rocking hourse. Most riders are for older children. Books with simple stories begin to be fun at this age. Try one with a simple story about something is familiar to your baby. Here you can see an 11-month-old baby boy in action. 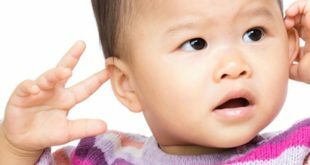 No Teeth for 11-Month-Old – Normal or Not?